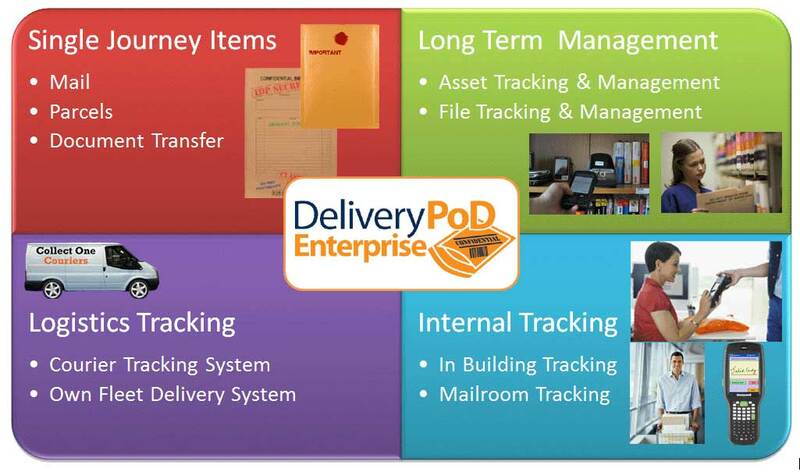 DeliveryPoD Enterprise is an off the shelf system for businesses that need to track high value or sensitive items across multiple sites. Benefits / Who Is It For? The system is used by organisations that need to move Sensitive Items (documents, data disks) or High-Value Items throughout their corporate infrastructure. It is worth bearing in mind that some reports can contain information that has cost an organisation millions of pounds in research. The loss of reputation to an organisation of losing confidential papers can be measured in millions of pounds as well. 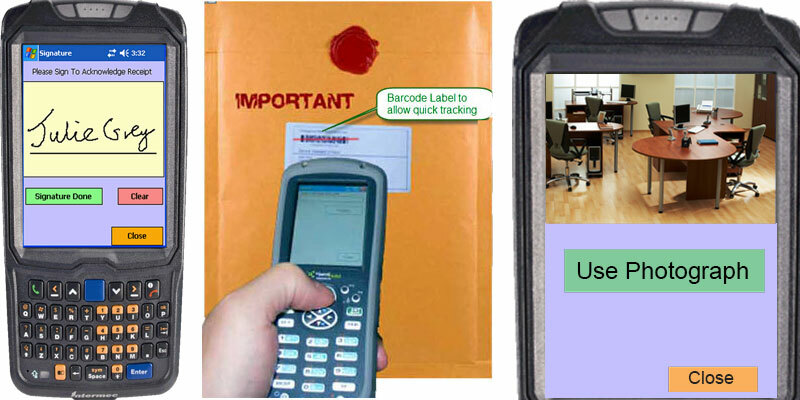 The software allows you to set up any Person or Department to be able to produce tracking labels and start an item on a journey. Sender – this is the “From” address and might be an individual person or a department. Please note the system knows the email address for the person it is being sent to, so requests can be set up to automatically enter that persons email address. Item has had damage recorded against whilst in transit. A Set Tracking Stage (such as “Delivery Van Loaded” or “Received at HQ”) has been completed. The gets to a set period of time before or after it is due to be delivered, but has still not actually been delivered. For example, a Solicitor may want a warning email if a letter they have sent to a site has still not been delivered 2 days after it was due to be. This concept of an early warning that something has gone wrong, can be vital in some organisations. To and From Country Availability and any notes. For example you could set up a “Next Day by 9am”, allow it for UK to UK journeys, not allow it for “Japan to UK”, allow it for “UK to Ireland” but put a note “Will not get to remote parts of Ireland” which will be displayed when somebody in the UK selects the Service and selects a Person / Department that is in Ireland. Service Level Reporting – set your own performance zones, such as “Very Early”, “Early”, “On Time”, “Late” and “Very Late”. Escalation Emails can be set so Logistics Staff, The Person Sending and/or the Person It Is Addressed to can get emails at set times before/after the due delivery time. You can set up a Lookup Table of Short Descriptions – so the person can just select the item. They can type it in. It also supports the use of Retail Style Lookup tables, where the user scans the retail barcode and the full item description is entered for them (for those working in healthcare, this includes GS1 GTIN barcodes). Retailers – can see all the store returns, the day before they arrive at Head Office or say the Repair Centre. If you add in that they can see the type of item, a Jewellery Retails Repair Centre can see how many Watches, Rings, Necklaces are going to arrive the next day and plan staff rostering to cope with it. NHS Logistics – Hospitals and GP Surgeries can see what is on its way to them and plan to receive it. Individual Person – They can only see what has been sent to them personally. Department Logon – They can see all items for their department at that site. Company Logon Individual Site – They can see all items for their company at that site. 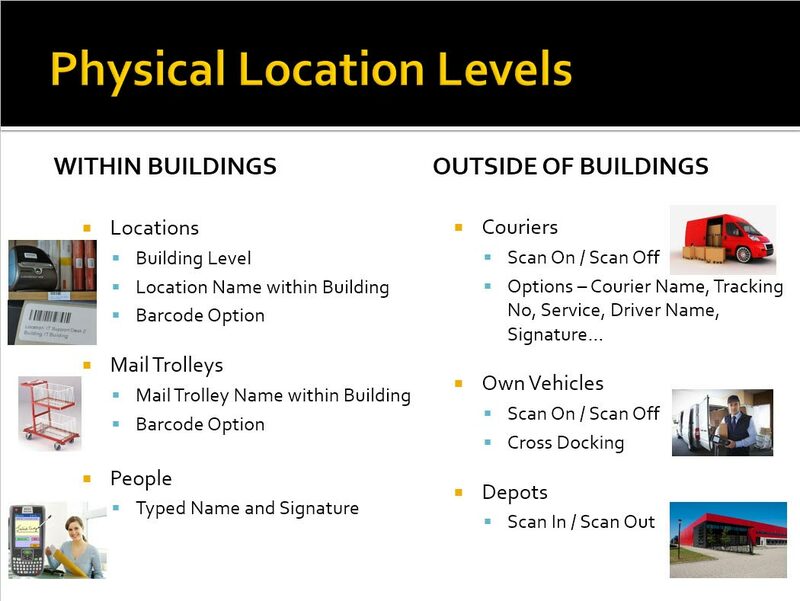 Company Logon Generic – They can see all items where the company name is the same, irrespective of address. Generic Login – You can give a person access to all items. Now people who receive items can answer their own queries, 24 hours a day, saving lots of time. When they see the item they are interested in, they simply drill down to the Tracking Report. The website is an ASP. Net web application that runs under IIS (5 upwards) and ASP. Net 4.0 upwards. It can be hosted on a standalone PC (need to check operating system) and servers. The database ranges from Microsoft SQL Express 2008 (free edition) for smaller systems through to Microsoft SQL 2012 Enterprise R2. We would jointly look at the scale of a project and agree on the appropriate server hardware and database configuration to match the amount of data / concurrent users. This is a Web Based system, which you can host yourselves or ask us to host for you. People that send items, people that are due to receive items can check on the website for the latest status/whereabouts of those items, by logging onto the website, using a Web Browser that is already on their PC / Laptop / Tablet. Single Journey Items – These are things such as important letters and parcels that go on a journey, which is considered completed when it gets to the other end. What Service are you selecting a Service which determines how long it has to arrive at the destination. This might be next day by 2 pm or maybe 4 hours from when it is made ready? It is it running to time or is it late (perhaps automatically send an email to a supervisor when it is 1 hour before due but is not in a vehicle or courier). Has it arrived or not? Did it get delivered on time? These type of items are with the organisation for years and are moved from time to time. Long-Term items might be allocated to a member of staff or perhaps loaned to a member of staff or external person and you need to automatically email them when it is due (and at set periods after) to get the item back. DeliveryPoD caters for both Single Journey Items and Long-Term Items. Now you can have organisation wide visibility of everything you need to keep track of in one system. Unlike most systems on the market, DeliveryPoD can track items both within buildings (such as offices, hospitals and banks) as well as externally (on vehicles. on couriers, in depots). 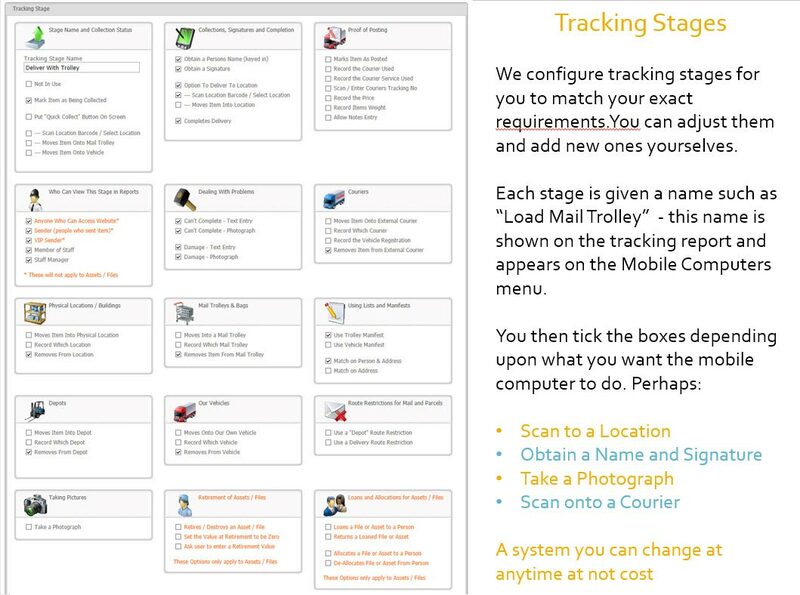 Tracking Stages are 100% configurable, so we set them up for each customer on installation. After that, customers can edit existing Tracking Stages as well as add new ones themselves. We are often asked, can it track from the collection at persons desk/departments outbox into the post or onto a Courier – at which point our job is done? Quite simply yes it can. We call it “proof of posting” and many organisations feel that at some point they may have to prove that a letter, document or parcel was put into the post or onto a courier. We set up DeliveryPoD for each customer. Our “Configurable Tracking Stage” approach enables us to create Tracking Stages to match a customers requirements exactly, in a matter of minutes. Each Tracking Stage is given a name (e.g. “Load Onto Mail Trolley”) and then boxes are ticked, based upon what we want the Mobile Computer / Smartphone to prompt the user to do and what buttons are shown on the screen. Customers can edit existing Tracking Stages and create new ones, which deploy to mobile computers in seconds. All of a sudden you have an Application Generator for anything Tracking. 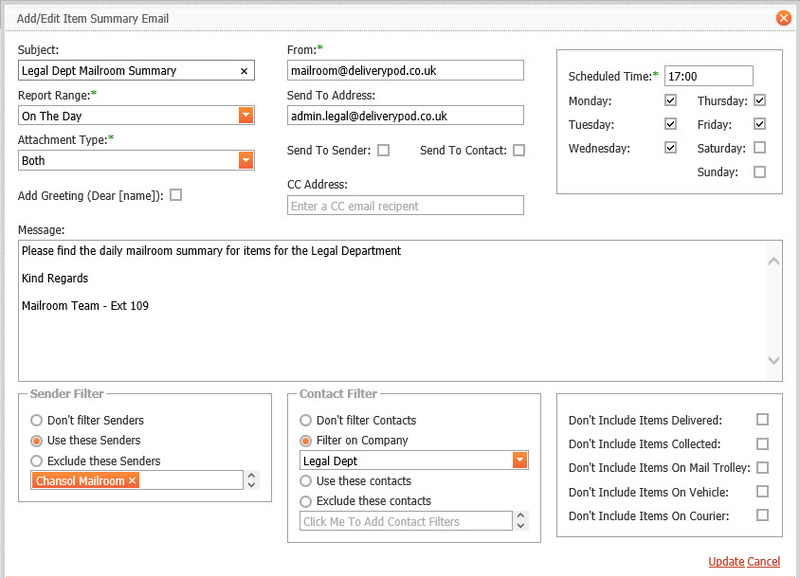 Automatic Email Requests can be set up to handle almost any eventuality. Since the Email Address of the person it is sent to is known, Email Requests can automatically Email the person it was sent to (if you tick the “To Contact” box in the email request). Similarly you can do the same for the person who sent it, as well as adding specific email addresses to the “TO” or “CC” sections. What this means is that you can have an automated escalation procedure, so items are not allowed to simply disappear in transit with nobody being informed of a problem. 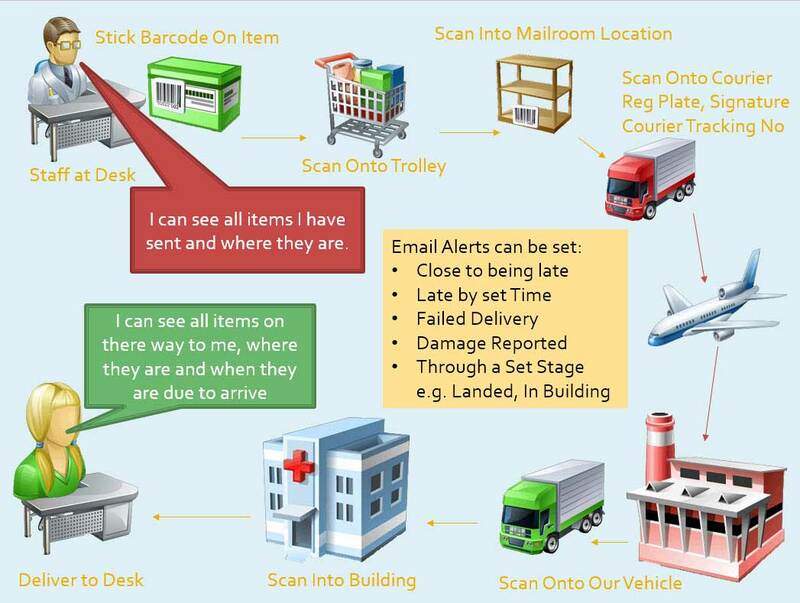 Summary of Items Sent to a Person / Department / Company is sent at a set time of day. For example the “Fraud Investigation Unit” can have a set of Email Requests that apply only when they send an item. So people / departments can have there own set up.